Conservative Americans are being kept completely in the dark about the secret Amnesty provisions for illegal immigrants being negotiated behind closed doors by the conference committee on the budget deal bill that must be voted on by this Friday, February 15, 2019, to avoid another government shutdown. Americans for Legal Immigration PAC is calling on DC lawmakers and the media to put the secret Amnesty deals on full display immediately as the current plan seems to be to ramrod Amnesty into law later this week while allowing the American public the smallest window of time to read, understand, and react to what is in the secret budget bill. "The secrecy around the budget bill negotiations needs to end immediately, and the American public deserves to know what scale of Amnesty for illegal aliens is in this secret bill," declared William Gheen, President of ALIPAC. "Amnesty destroys all walls and barriers and attracts more illegals into America at a time when new estimates say we have more than 22 million illegals in the USA with another 5 million inbound in the next 12 months. 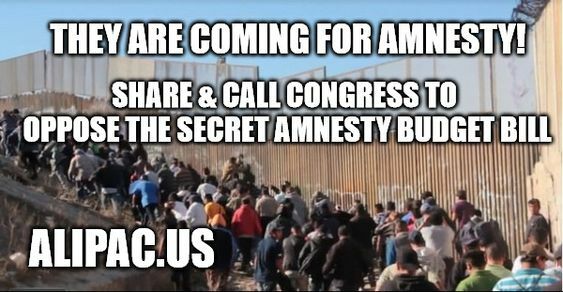 The illegals are coming for the very legislative Amnesty Congress is considering behind closed doors today, and if President Trump signs an Amnesty bill for DACA Dreamer illegals, America is all over but the crying. Americans deserve an end to this secrecy and more time to react to what is being put in this secret budget bill." While ALIPAC believes Amnesty is in the budget bill because of reports indicating Trump's lifelong Democrat son-in-law Jared Kushner has offered Amnesty to the Democrats in return for wall funding, and the Trump administration endorsed and backed three Amnesty bills in 2018, which were defeated in Congress, that traded Amnesty for millions of illegals for construction monies and promises of future immigration law enforcement. President Trump has tweeted he is open to Amnesty for illegals as part of a larger deal (View Tweet), and said in his State of the Union address he wanted to increase legal immigration levels beyond their current historic high levels. Yet, there is no information found in President Trump's State of the Union address or border rally speeches about erasing and upending the current immigration laws of America to accommodate and please Democrats and their new bloc of millions of illegal alien voters , and the DC lawmakers speaking to the press are not discussing those details of the bill with the American public. Trump knows his support levels would plummet among his own base if he speaks openly to audiences about his below deck efforts to give Amnesty to illegals. Yet the power groups supporting "immigration reform" Amnesty for DACA and Dreamer illegals as a prelude to full Amnesty for the estimated more than twenty million illegals in America know and are mobilizing today! The pro-Amnesty Republican Koch Brothers are sending young illegal aliens to DC this week to lobby lawmakers for Amnesty, and the same Silicon Valley CEOs who have been censoring conservative voices on Facebook, Twitter, and Google/Youtube have paid for an expensive full page ad in the New York Times today extolling their desire for legal status for illegal immigrants! While Trump voters, Republicans, conservatives, Constitutionalists, and American patriots who have risen up and stopped all Amnesty bills in DC since 2004 are being kept in the dark, the pro-Amnesty groups are going into full mobilization! ALIPAC is working to warn all Americans that Amnesty for illegal aliens is a core part of the current secret budget bill negotiations, and while the power groups that support Amnesty are fully mobilizing, Americans may be left with only a matter of hours to react to the text of the bill when released before Congress votes on it. The DC elites are operating in secrecy and planning to ramrod nation-destroying Amnesty for illegal aliens into law while depriving American voters and elected officials an opportunity to even know what Congress will be voting on. Last edited by ALIPAC; 02-12-2019 at 01:10 PM. Suggested sample message: "As an American voter, I demand that Rep/Senator _____ make the contents of the secret budget and Amnesty bill public immediately and give the media and voters like me at least a week to read, understand, and react to the bill before voting on it. There is currently a plot in motion to put Amnesty for illegal aliens into the secret budget bill and have Congress vote on it before Americans can even know or react, and this is not the kind of behavior and abuse of power we pay taxes for. We demand to know what is in the secret bill and to have plenty of time for discussion and debate before any votes!" The enemy is sending in illegals to lobby your lawmakers and is buying expensive full page ads this week! We need you to mobilize, ALIPAC activists, and light up those DC phone lines now! Last edited by imblest; 02-12-2019 at 01:08 PM.